An administrator accused of assaulting a student at Mission College Preparatory Catholic High School in San Luis Obispo was placed on administrative leave after his alleged victim was granted a temporary restraining order. 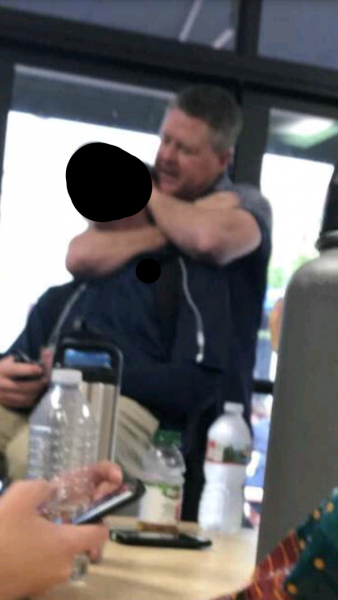 On Nov. 3, Russ Griffith, a former SLO police officer, placed a student in a headlock during lunch for allegedly using a curse word. A hold the SLO Police Department only allows officers to use to restrain violent or combative individuals, according to department policy. Shortly after the altercation, Mission Prep administrators placed Griffith on suspension and the police department sent a report of the incident to the district attorney’s office for review. Just three weeks after he placed the teen in a carotid choke hold, Griffith returned to work at Mission Prep. A few days later, a judge granted the student a temporary restraining order against Griffith, the director of student life. Griffith is currently prohibited from coming within 100 yards of the student, a 16-year-old football star. In court documents, the student claims that he used a curse word toward a friend while telling him to turn off annoying, loud music. Griffith then approached him from behind and unexpectedly put him in the choke hold. While restraining the teen, the administrator threatened that he could drop him or make him pass out, the student stated in a court document. The student also claims that, while being restrained, he could hardly breathe and felt like he was going to pass out. “As you have probably learned from the media, one of our students recently obtained an ex parte temporary restraining order against the Director of Student Life, Mr. Griffith. I learned of this from the media late Monday afternoon. I want to assure you that Mission College Prep followed its procedures in dealing with the initial incident and will continue to act in the best interests of our students. Mr. Griffith and the school have agreed that he will take a leave of absence until the hearing on the order. This is a deeply unfortunate situation but one that we will weather. I believe that steps have been taken to absolutely ensure the safety and personal dignity of each of our students and that Mission College Prep is a safe place for our students, faculty and staff. I keep thinking I should be shocked, dismayed at the very least! However, I am more saddened and disgusted, by every new or ongoing scandal that I research. It is not just a few here and there within this law enforcement agency, (there are a few good solid officers serving with all the integrity they safely can muster! Just biding their time to retirement, I get it!) but…extends to the protectiveness of the DA’s Office and finally its Judicial. The collusive behavior that is just business as usual within these agencies, would make the good citizens of this county shiver in fear. If only they would really make a sincere effort to come out of their protected cocoons, step outside the box, and really get informed about the MANY scandals, rigged Judicial, elbow rubbing corruptness in which the system is being manipulated! All in the name of these good citizens protection!! I do believe, if they took the time to research, investigate they would find… that the watch dogs are more corrupt than the majority of those being accused, and even coercion. manipulation, out and out threats by these “so-called pillars of the Communities” legal system will not think twice to commit blackmail to get what they want…and is not beneath them. I realize this could be considered a personal affront to those who would take my opinions as such?! Unfortunately, I state these things with a heavy heart of knowledge… because as an American, I believe in the truth of our system, the responsibility as a citizen, and am sickened by the rampant and blatant abuse that is being worn on the sleeves of many that we should be able to trust. I sense a bit of bias in this new story. Number one, it was not a headlock it was a “chokehold”, The same maneuver that killed Eric Garner in New York. Number two you state that the student is a “football star” leading one to believe that he feels like he is a privileged youth and above the rules. Child abuse is the silent disability as one who is a victim of it suffers as they navigate through life. A former San Luis Obispo Police officer working in a position of monitoring school children! Seems like a downgrade, which leaves one to wonder why he left the police department in the first place and if he has a past history of using excessive force. This is an affront on various levels, one when citizens see law enforcement personnel acting in this manner it leaves a bad impression on the others officers who dedicate themselves to help and use good common sense. Human nature shows many people are to quick to paint with a broad brush. Second, what impression are you leaving on this young person who is growing and trying to work his way up to the point of maturity? Seems the world today has slipped a few gears when it comes to how we treat others. Oh sure, here in this instant the officer had to come from behind this student and place him in the chokehold, after all he could have presented a clear and present danger to the officer! How would this thoughtless action effect his growth from here on out? Not all, but there are officers who allow their badge to become to heavy, others have to grow into it, but the latter in the case, was a seasoned officer now working to protect children. Perhaps he would be better suited working in a different profession. On leave again $ with pay ? Officer or now X Officer Russ Griffiths was suppose to take a criminal case and failed to do so. Even though he did and does not like the New Chief as many other do not, many have retired very early all because of her failures of a leader and she does not [pass] the DSM I, II, III, IV etc DSM does NOT allow for Gay’s in Law ENFORCEMENT, she has a serious Mental flaw thus Russ and many other retired. So Back on July-14-2015 this now X officer Griffiths refused to take a Criminal Report involving some students and faculty . The Cover Up was in check, soon after he retired and went to the MPS and did a no no by touching, man handling, assaulting, battering a young male student.